We rose early enough to say goodbye to Stacy as she left for work, spent a leisurely hour packing up the car, and headed to the airport. Without the Security Kabuki we’ve grown so used to in America, the time from parking to waiting for our flight was something like 10 minutes. How very much like my memories of Grand Junction, Colorado’s wee airport when I was a lad – of how things used to be before the Fear Industry took over in the US. 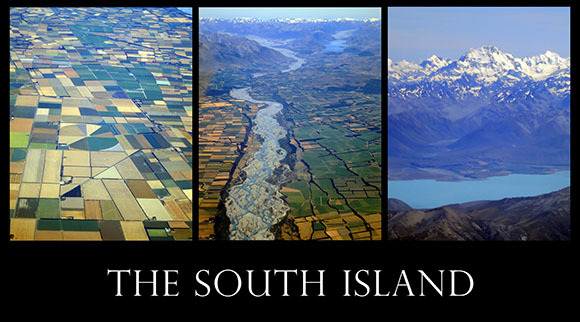 A couple hours’ flight south, we were excited to watch the acres of farmland give way to the “Southern Alps”. 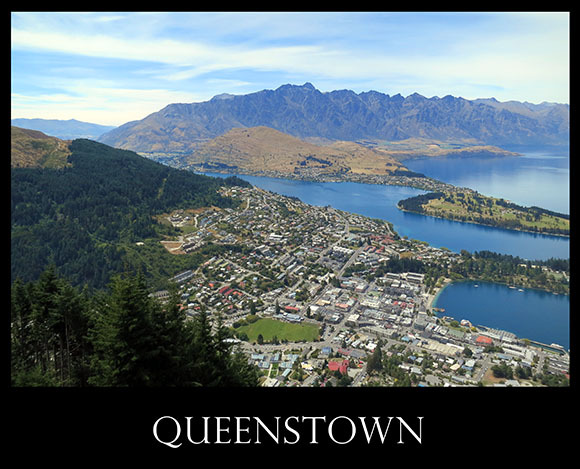 Queenstown is a big mountain resort town – part Switzerland, part Montana, part Aspen. We ate lovely local ice cream in the airport and took a coach to our hotel with the lakeside view (just like most every building outside the very heart of town). A short walk to Thai food and a brief shopping expedition followed. We came back to long baths and more reading. Ah, vacation. After cereal and yoghurt in our room, we headed to the Vudu Cafe to meet up with NZ photographer Trey Ratcliff, who had kindly helped publicize the charity calendar last year. A brilliant photographer and lovely person, Trey showed us a few splendid photos and kindly offered tips of things to see and places to go. First among these places was the top of the nearby mountain. A large gondola takes people up, and then a small chair lift takes them further up to use the luge. 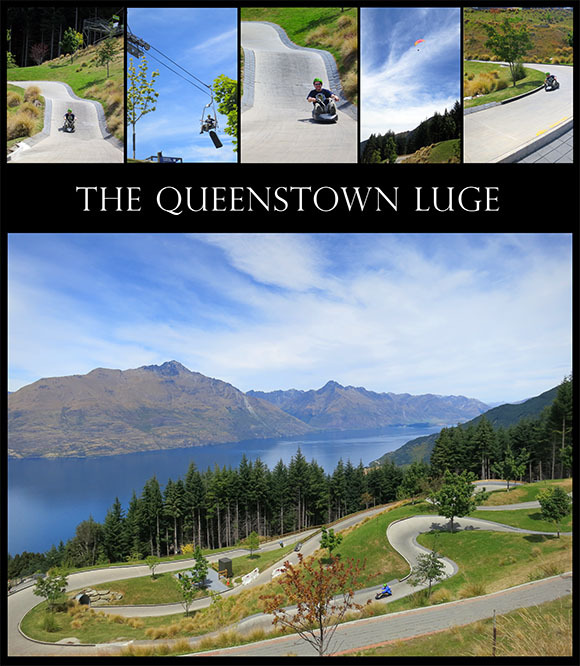 This may be just a glorified go-cart track, but it’s got the best views imaginable. Top o’the world Ma, top o’ the world! After my first 3 runs, Venetia and I headed in for lunch – only to encounter Trey and his lovely wife and kids! They were celebrating the kids’ last day of freedom before the onset of school and shared both their table and foodstuffs. Venetia and Trey exchanged book recommendations, and before we leave town we hope to pass along the copy of Mark Hodder’s ‘A Red Sun Also Rises’. Serendipitous indeed! I took 5 more runs after lunch as tandem paragliders wafted overhead and Venetia took in the view. I could have ridden all day if the passes so allowed…. But ice cream and a walk around the garden awaited, before a trip to the jacuzzi and a proper appreciation of sunset. We’re certain this would be a fine town for star-gazing, but we find ourselves thoroughly unconscious by the time any stars would think to show themselves…. Day 12: Sometimes the treasured things are not the things that last…. We arose early to meet one other small drop of rain in the lobby. From there we joined a small rivulet in the tour bus. 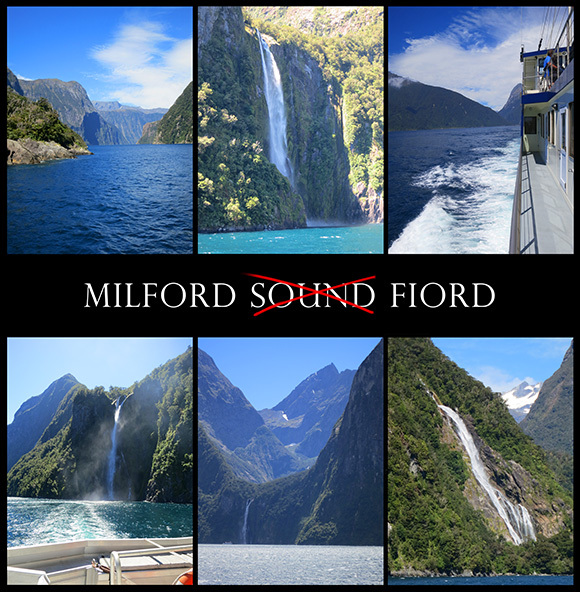 Eventually the bus picked up enough others to stream away from Queenstown on a 4 hour ride to the Milford Sound (a mislabeled fiord). 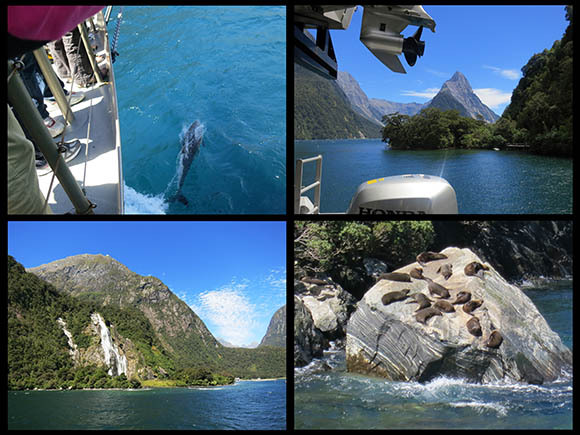 In the Sound we joined with other streaming tourists and put out to sea – sailing into the Tasman Sea before turning back around. To say that Venetia got carsick through the winding slopes and tilting hardscrabble tunnel en route would be an understatement, but then I suppose some things are better left understated. By happenstance Brownie, our driver, a Maori from Rotorua – a good communicator in English and Maori, and an excellent salesman – told a tale of native medicine that Venetia immediately put successfully to the test (though it seems to have turned her tongue bright orange). Here’s to native medicine! 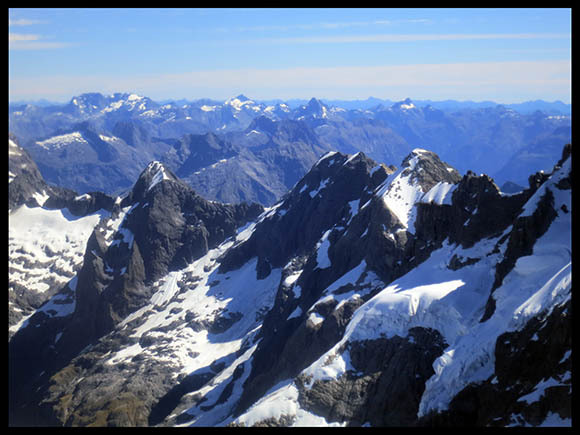 Mountains everywhere as we climbed (and eventually descended) the Southern Alps. 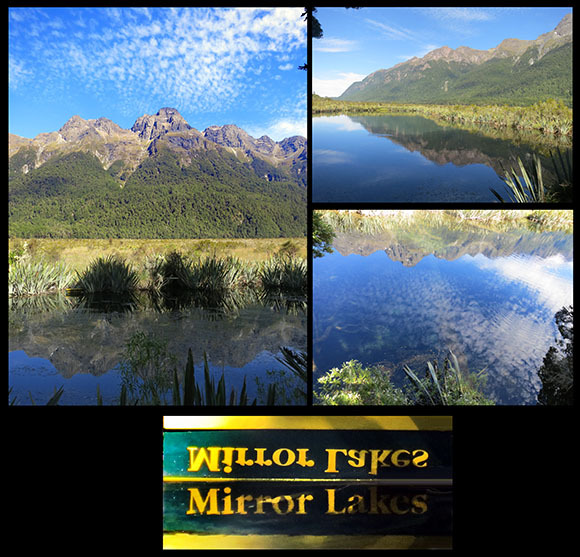 The bus driver wanted to make sure his passengers signed on to hate a high-speed rail from Queenstown that the local Maori groups were lobbying for, but his reasoning was purely corporate – the rail in question would clearly be better for the environment. But it would make the long drive he was taking us on obsolete. And the tourist town stopping point (“Want a toilet? That’ll be a dollar, thank you,”) would suffer far more than bus passengers without that crucial dollar…. We both found the cruise astonishing – the animal life consisted only of a couple gulls, some suggestions of lobster by the intermittent traps, some very relaxed seals and a delightfully playful dolphin – but the sheer topography of the place! We happily braved the 10k summer wind coming off the water, but at the end of the day, there was no way we could sensibly take 4 more hours of bus trip back. So we didn’t. 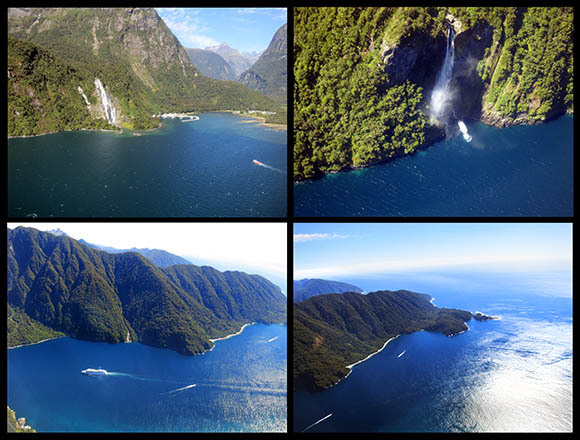 Instead, we flew in a tiny plane over New Zealand’s breathtaking fiords. Our scenic 4 hour trip condensed, through a desire to stay outside our comfort zone and the miracle of cash, to a mere 40 minutes – barely reaching an altitude high enough to cross “the Wall” of the Darran and Humboldt Mountains (with their amazingly beautiful, but otherwise unattainable tarns) in time to come right back down. What an incredible day. Our hearts are still in our throats, and amid the bumps of the cruise and return flight I’m sure that many of our pictures are blurred messes, but today is our last in New Zealand and we went out with a bang! 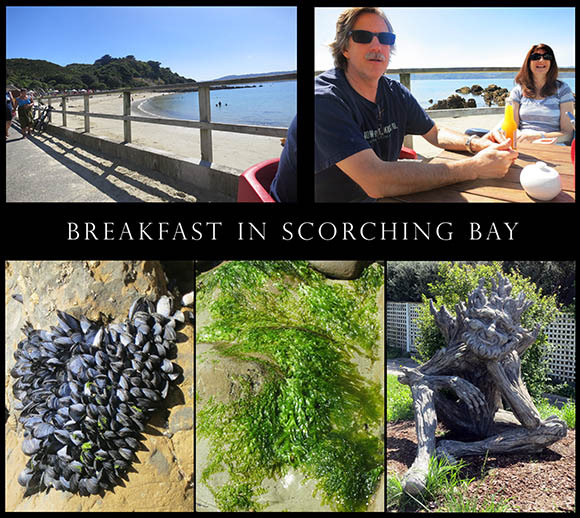 After a surprise morning delivery of crayfish (what we would call “lobsters”), our kind hosts took us around the peninsula, past one of Sir Peter Jackson’s two houses, for a proper Breakfast in Scorching Bay at a table overlooking the beach. It was civilized indeed! After some fun in the sand, and the requisite photos of marine life made visible by the low tide, we headed up the coast to see this sculpture of a Tree Troll by Stacy’s friend Kim, who we hope to meet tomorrow. From there a drive into town to see about getting my phone to work (for me, not for greedy international carriers that is). It wasn’t easy, but at last I have an iPhone that is “unlocked” and able to accept local sim cards instead of the highway robbery of “roaming” charges. What works here in NZ won’t work in AU or elsewhere, but an unlocked phone means that I should be well prepared for November’s trip to the UK. 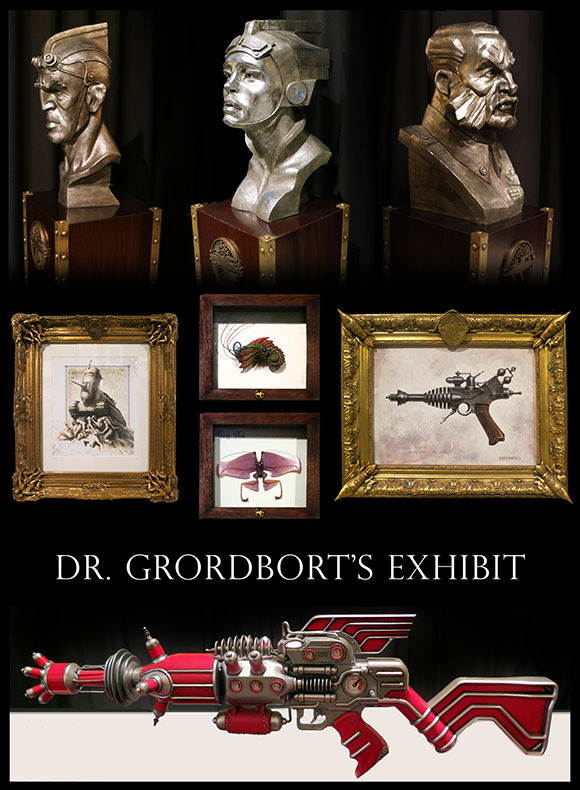 The Wellington city government decided to offer WETA ace Greg Broadmore an empty storefront on Cuba Street for his traveling Dr. Grordbort exhibit (next stop – Dubai). 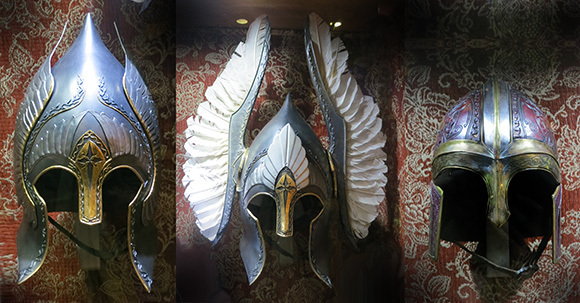 We caught both the exhibit (oh to have the resources of Weta to build MY frames!) and it’s prime mover (such a lovely man considering the vasty Venusian carnage he wreaks!) at a serendipitously timed signing, and hope we might see him once more before we pull up stakes and head for the South Island! But we could only stay long enough to get a book signed (and drawn in) for Keith Baker – we had to meet my old pal (and US Diplomat stationed in Wellington) Marie D’Amour. 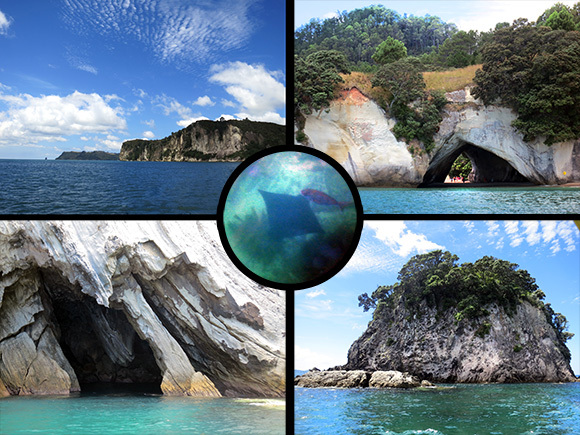 On the way to the TePapa museum we passed a shallow harbor filled with boaters and, below them, gliding rays. 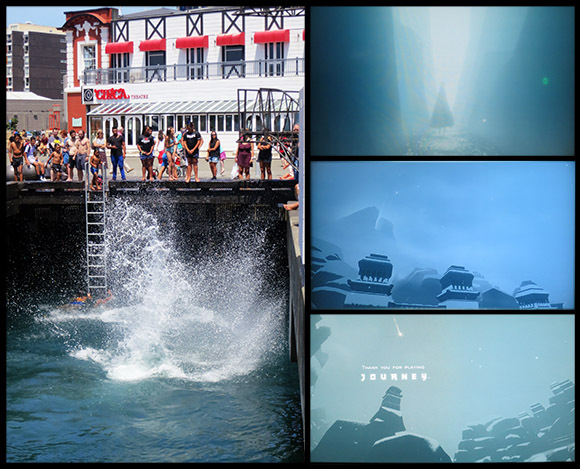 We passed happy tourists and delighted locals who were making full use of the steps and ladders to dive into the cool waters below – focusing (rather painfully I imagined) on creating as much splash for the onlookers as possible. But we hurried on to the museum where we found Marie and her visiting (and also diplomatically-minded) niece. After a brief but splendid chat, we paid our fees and entered the complexities of the Gamemaster exhibit. The early games (Defender, Galaga, et al.) were ones that I well remembered. The batch in the middle of the chronology were things I’d witnessed only in passing (Black and White, DDR, Zeldas, et al.). But there was a crop at the end I’d never even heard of. I was charmed with Blueberry Garden, but did not play it long before moving on to a 3-game portfolio of That Game Company – Flow, Flower and finally Journey. I played 1 creature and 2 flowers fully through in the first games. But like someone who comes to Vegas and sits down at a slot machine that’s been played unsuccessfully for days, I moved on to a partly completed Journey and played it entirely to its conclusion (in the very nick of time! The exhibit closed as I watched the end credits roll). I found it beautifully ways I’d never imagined a game managing – almost as if Nicholas Roerich and Mary Blair had decided to work on a sequel to Myst with Carl Jung… Hearing that some friends in Portland own it, I may try to study its elegant minimalism a little more when I get home – it’s a treasure. As great as I found the exhibit, I admit to some chagrin at missing the rest of the museum entirely. Perhaps we’ll manage another, more history-minded, visit tomorrow. 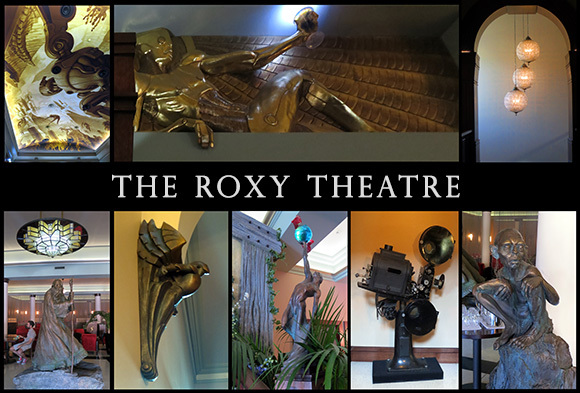 We briefly peeked into the Embassy Theatre (whose Gandalf is larger even than the Roxy’s) and established to my satisfaction that Wellington has the best theaters with fancy dining than anyplace I’ve ever been. Even if they need a proper Wizard to defend them…. Upon returning home, we we’re treated to those aliens from District 9… well, to their crayfish cousins anyway. Eric dealt with the Lobsters while Stacy whipped up home-made chili. 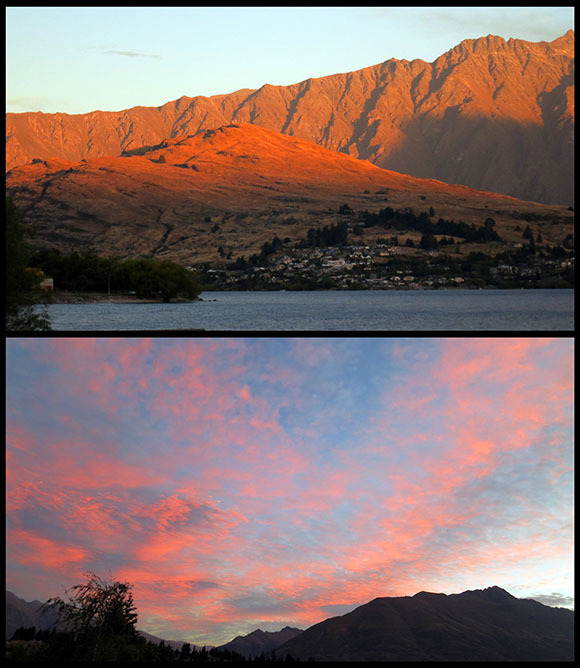 After a beautiful sunset we headed back to Gandalf (who is literally bigger here in Wellington than Queen Victoria) and feasted on the Pavlova (the Kiwis’ national dessert made primarily of kiwi fruit, cream, and meringue) at nearby Strawberry Fare. The resultant sugar coma sent us happy to an early bed. 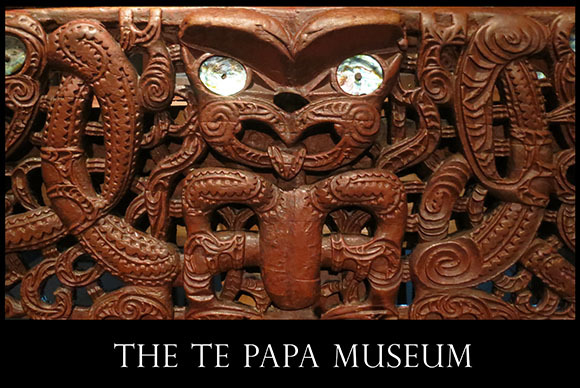 The day began slowly, but we finally sprang into motion and headed back to the Te Papa Museum after noon. As I was considering the steep parking fees a fellow with a German accent approached and asked if I’d paid to park. I told him I was considering it, and he handed me his parking pass. Apparently the 3 hours he’d used were as expensive as the all-day pass, so he paid for the full day, and why didn’t I just take his? We tasted the local salmon at the Sunday Market and admired the many locals basking in the summer sun. The museum was every bit as interesting and wonderful as we’d suspected. 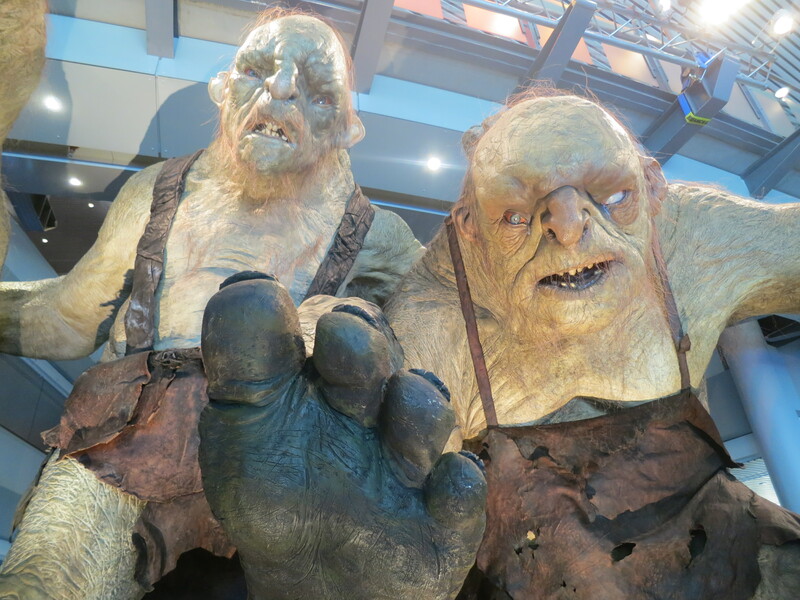 Some of the films were silly and poorly conceived (the gimmicky black animated bit on the giant squid) and others wonderful (base jumpers and photographers and sheep farmers and paleo-kiwis talking about what the land means to them).But wherever one travels in New Zealand, the spirit of JRR Tolkien is never far behind – The Hobbit’s 3 trolls were visiting the museum too – dangerous dudes to be around! After a brief return to base, Stacy and I headed off to see a hidden Dragon – happily there were no Crouching Tigers about. 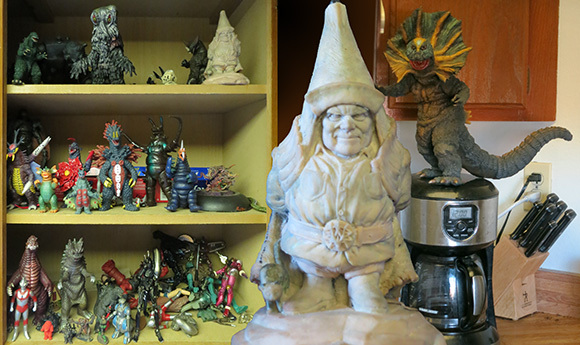 Stacy’s sculptor pal Kim Beaton (who made the wood troll we saw yesterday) has created a wonderfully friendly dragon who is sheltering a fox and a hedgehog. And she made it out of a new high-tech concrete that requires no metal framework or other materials. At the end of our visit I got to help restore the dragons protective cover, but now that he’s properly cured, this will be his last day under protective wrapping. Later that evening (and a remarkably hot one it was for Wellington), Stacy and Eric hosted a swell gathering of artists – Daniel Falconer arrived with Paul Tobin, Greg popped in, and I had a fine chat with Kim about art and t-shirt design. Tim-Tams and baseball-themed beer accompanied conversation about fireworks, large insects, world travel and the Hobbit. Conversation about the game Journey was later echoed in a surprising way as we watched a firelit Chinese lantern ascend, rising slow and straight into a remarkably calm clear twilight. Another followed some 20 minutes later. Gorgeous. What a wonderful visit and send-off. We loved Wellington. Day 6: You Will Believe a Man Can Fall! We lit out of Rotorua and were well past many of the geysers when we were stopped in a mandatory traffic stop. I’d never had a breathalyzer test before (as a teetotaler that was probably due to a complete lack of anything approaching probable cause) but this one was administered in a jiffy. The nice policeman saying (in his nice Kiwi accent rendered here as phonetically as auto-correct will allow): “hee’s ya mandatory breethalyzer test. Weea troin’ ta mike shua droivas sty awoik – so theys coffee and free ois cream ova thaya.” indicating the small crowd of confectioners and baristas on the left verge. 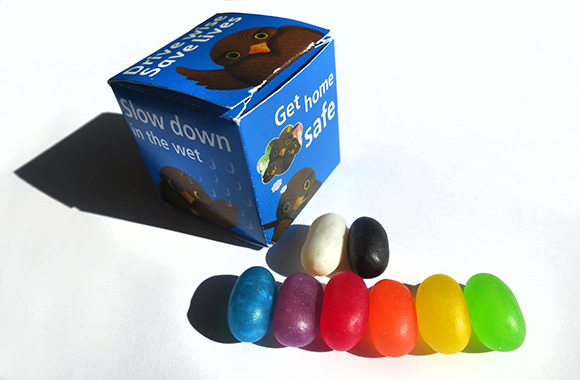 When I didn’t look like I’d be taking them up on it, he handed me this box – branded with the local safety mascot and filled with jelly beans. The drive past Lake Taupo and the climb up past Tongarira Crossing were beautiful. As were the escaped horses on the highway, despite the clear danger they presented to themselves and others (like the car-carrier who’d stripped the driver’s mirror off the car in front of us). But after that it was smooth sailing at the speed limit. Until the madness of The Flying Fox that is. There, we far surpassed the usual 100km speed limit, and without worrying for the safety of our rental car. 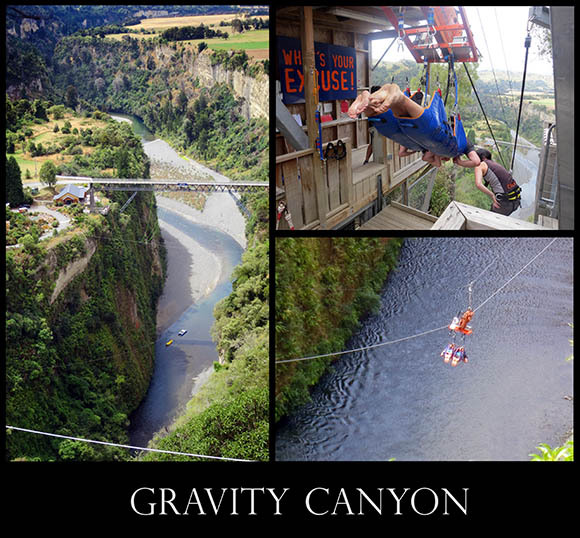 We went down the zip lines of Gravity Canyon face-first at 100 MILES per hour. Words do not do it justice, but this video (of others, because I’m not going to pay $45 to watch myself fall) might begin to suggest the experience. Venetia was deeply worried going in, but her screaming stopped almost immediately as we enjoyed the surreally calm and beautiful flight. 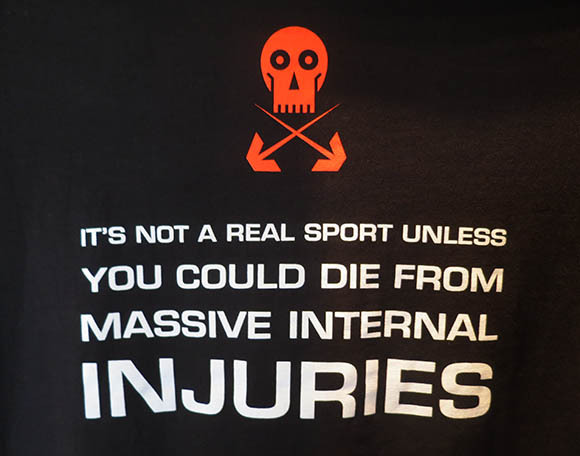 2 seconds in, my thought was “This ride is already too short!”The winching-up backwards was a rather different matter, but despite that uneasy feeling (and their motto on the shirt below) I cannot recommend this adventure strongly enough. A few more hours’ drive south led us to the very southern tip of the Northern Island and to the Wellington home of Stacy & Eric where we enjoyed delicious food among the locals – many of whom are colleagues of our hosts at Weta Workshops – an easy view of which lies a couple blocks down the hill from their house). A brief shopping run yielded licorice, chocolate, ‘tasty’ cheese (for ‘cheddar’ is curiously unknown here despite John Cleese’s protestations to the contrary “But it’s the single most popular cheese in the WORLD!” ringing loudly in my head) and other delicious (if pricey) Island goods. We awoke early and got loads of stray ducks in a row. Photos, blogs, hygiene – we did it all. And then we headed for the Roxy. Apparently when one makes several of the world’s most successful films, one can purchase and renovate an amazing art deco theatre – stocking it with posh seats, lovely food, a giant bronze of Sir Ian McKellen as Gandalf, and a massive mural and finest Deco fittings by Greg “Dr. Grordbort” Broadmore and company. Who knew? 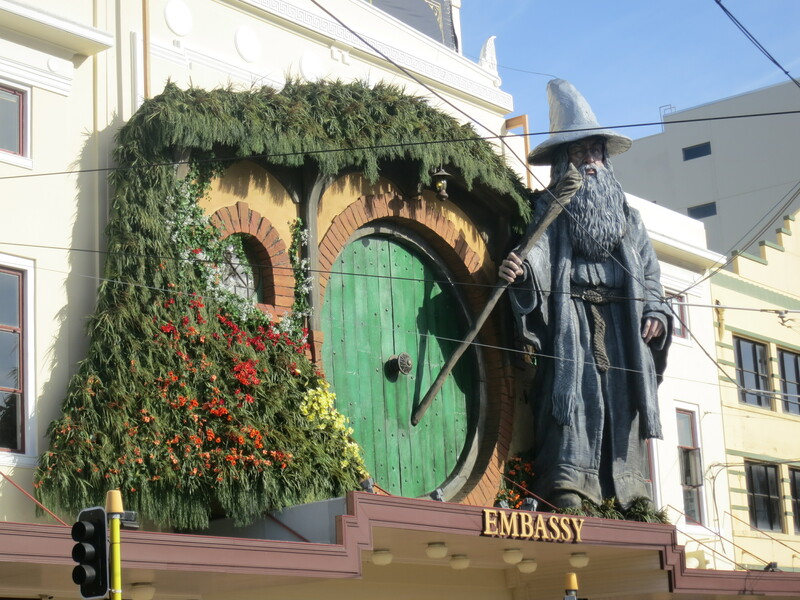 Stacy had only mentioned the theatre in passing, but since we knew we were coming, why not wait to see the Hobbit until we could see it on its home turf? 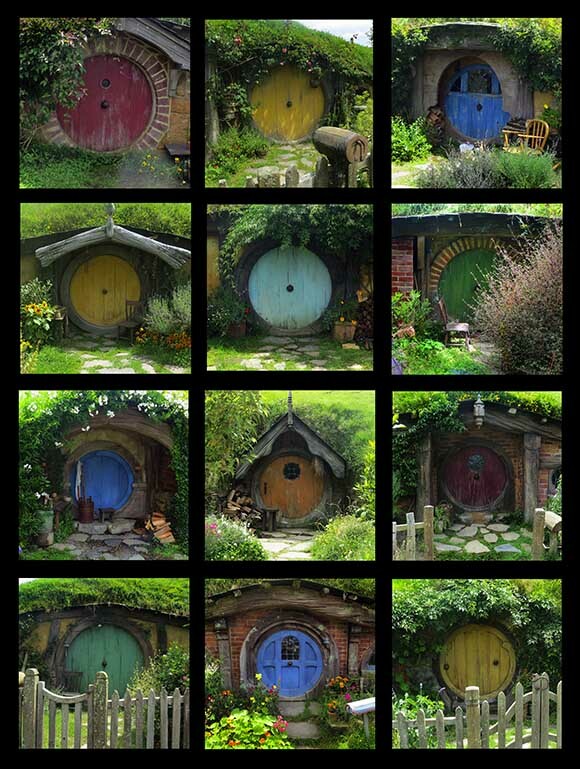 And after we’d visited Hobbiton ourselves? 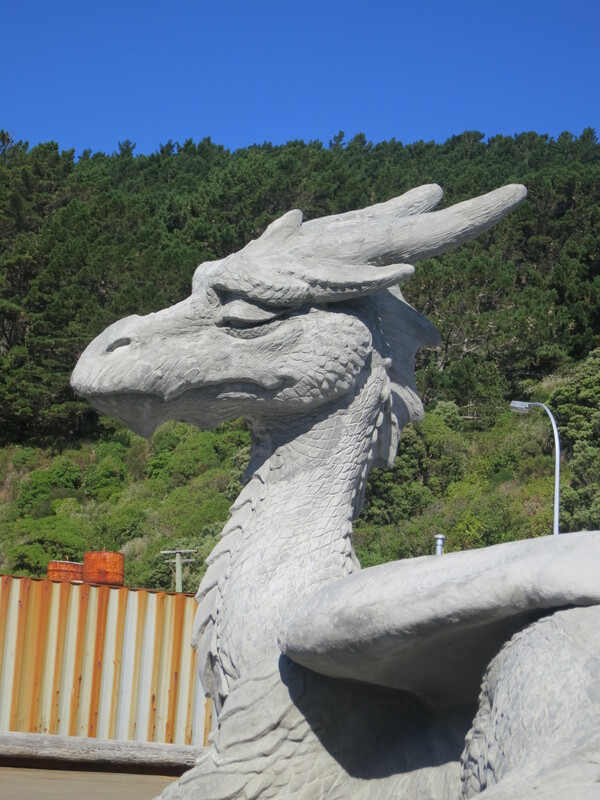 And when we could nip over to WETA for the tour after? It all went to plan, and a marvellous time was had. We arose early in the planned community Pauanui, but any belief I’d had that we were up before anyone was quickly quashed by the dogged enthusiasm of a friendly little Yorkie. Given the chance, he’d be with us still…. After a brief stop in Hamilton (to get directions to Hobbiton, where we had signal to do so), we travelled south to Waitomo. The cheeky little birds who sought our delicious lunch were not deterred by noises, motions nor splashes of water. Their dinosaur forbearers would have been proud. After a gradual climb down into a complex (and very smartly lit) cave complex, e leader of the tour shut out the lights. Venetia, notoriously claustrophobic, held up brilliantly, even then. The first few glow worms were high up and relatively isolated. But once we boarded the boat, and floated under the blue starred cave sky, the caves became truly sublime – Breathtaking in their strange and genuinely alien beauty. 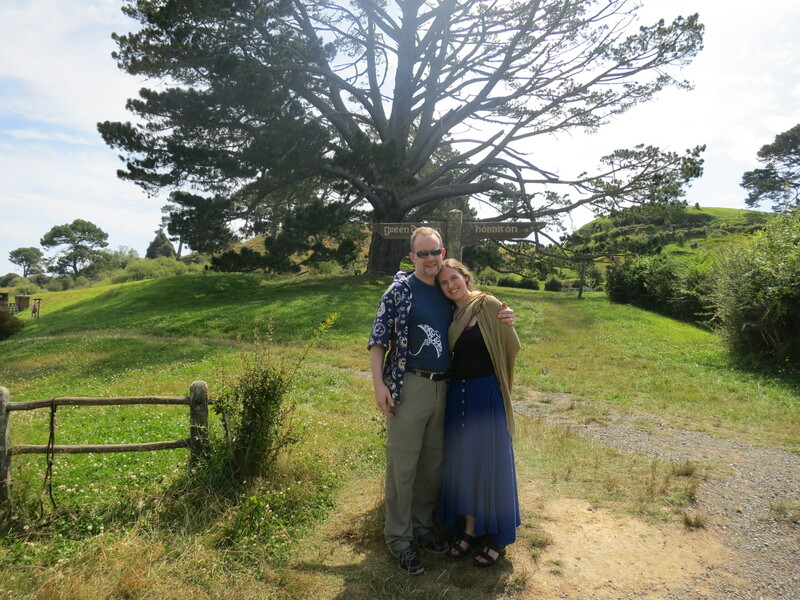 Two hours later, we’d come to Hobbiton. What can I tell you? Probably little that you don’t already know that you’d be the slightest bit interested in. 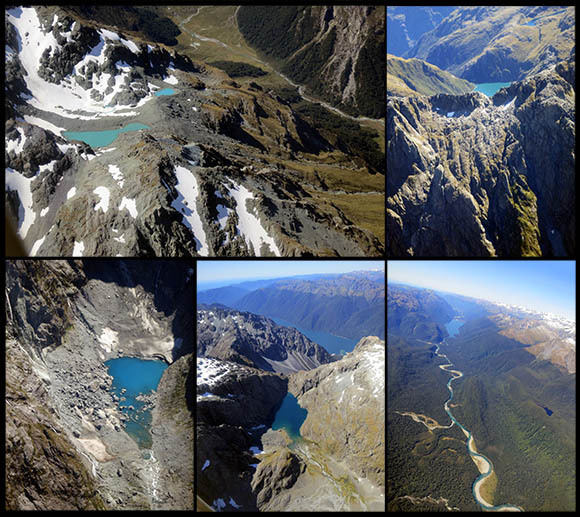 We haven’t yet seen The Hobbit, but of course we knew the ground pretty well from the Lord of the Rings trilogy. It was rather nice of them to repair the temporary sets from those films just so that we could get the full experience. The cakes and ale at the Green Dragon Inn went a long way making up for the throngs of over-charged tourists buying overpriced tchotchkes in the makeshift “Shires’s Rest”. 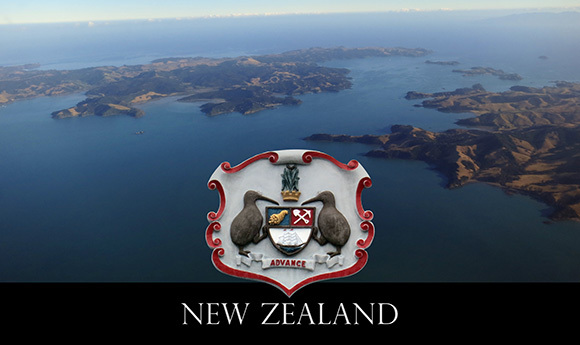 But for all the pain of the prices throughout New Zealand, there’s not a thing we’ve done yet that we have the slightest regret for. And the sight of lichens and mosses hand-painted in the exciting new medium of wood chips and yoghurt? Priceless. 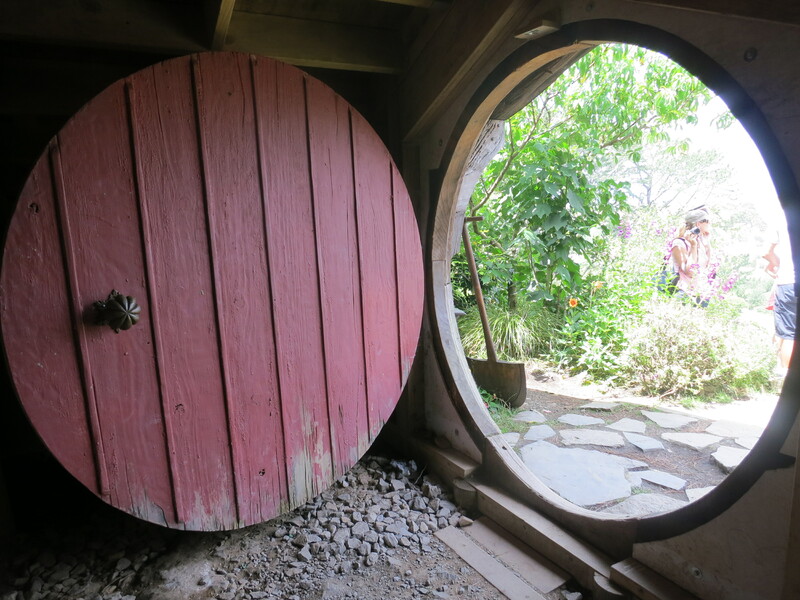 The camera died at the end of our unexpected journey, but we captured most everything… but the ring. 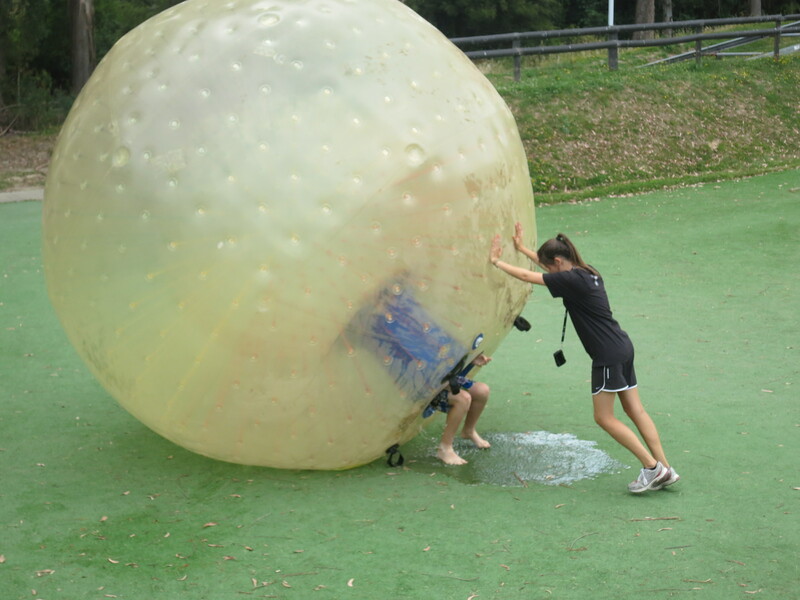 For the last three months at least, we have told every single person had a decent conversation with that we were going to go Zorbing. Today was that prophesied day. We waited until the afternoon for the day to warm up a little and then carefully picked our outfits for the event, a t-shirt and swim trunks for myself and her two-piece swimsuit for Venetia. 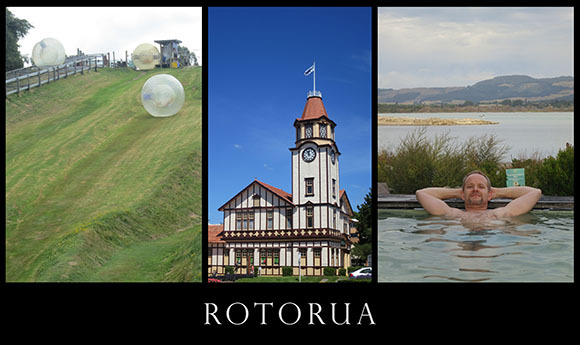 The Zorbing track was less than a fifteen minute drive out of town, although we were momentarily fooled by a faux Zorb course a kilometer or so nearer to Rotorua than the one we’d scoped out in advance. After sunscreening and registering, we waited with a pre-soaked father and son for our ride up to the top of the hill. Tonight we continued our hot springs tour of the world at The Peloponnesian Spa. 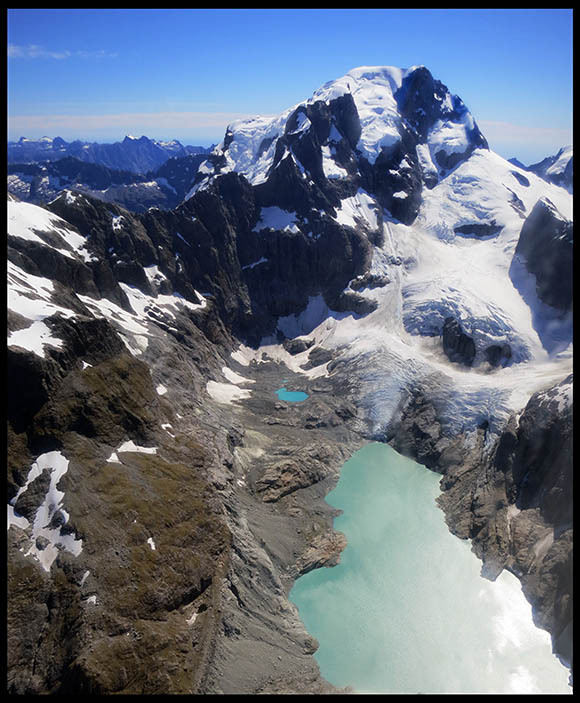 ** we tested all 7 pools in our section, spoke with Sikh dentists from London and French-speaking bartenders from Waitomo. 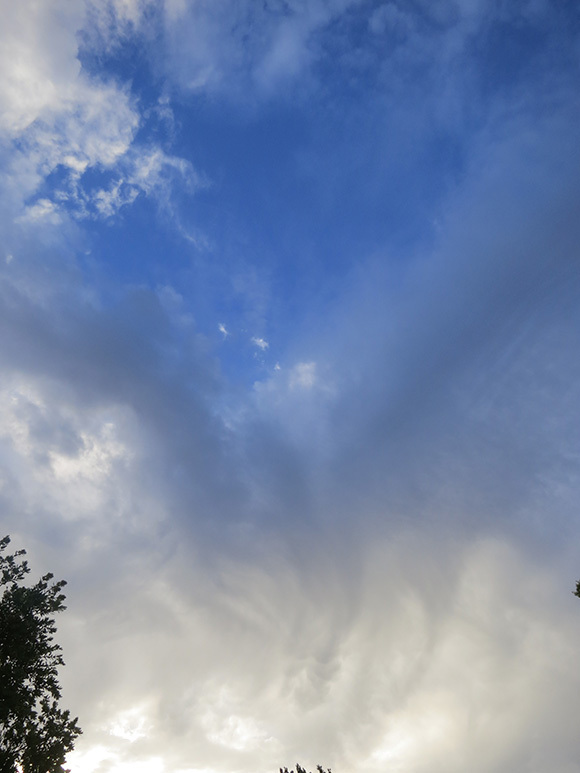 The sky was as glorious as the springs. *While we are led to believe that Neil Gaiman is himself down under, and while we would happily have taken him Zorbing, the savvy among you must by now realize that Neil was, in this story at least, represented in effigy only – on the splendid laundry bag that Kitty had kindly given us in LA. **Actually, Sparta led the ancient Peloponnesian League to war with Athens back in the day. 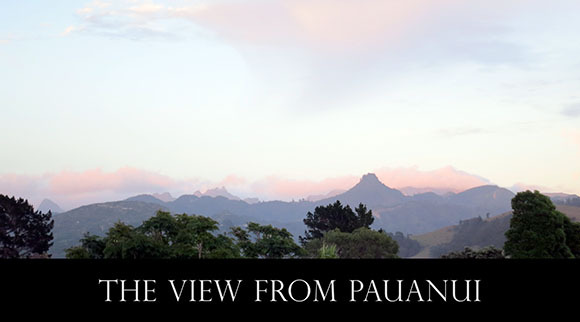 This really has nothing to do with the amazing spa in Rotorua, but somehow we found it more fun that saying “Polynesian”. We are a silly people. Day 1 – This Time We Really Mean It! A large part of this trip is specifically for the gathering of reference that cannot be attained elsewhere – texture and context. With that in mind, the trip was off to a magnificent start. 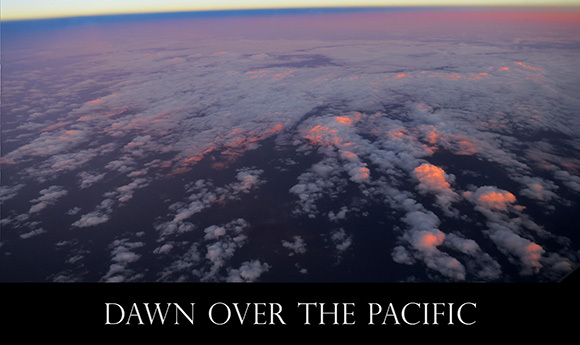 The dawn skies shifted and glowed – and since we were fleeing the sun, we got far more minutes of dawn that we’d ever get otherwise. Fantastic. Many UI experts, English Mavens, and Facebook Memes rightly sing the praises of the Oxford Comma. But after the long line at customs, renting a car, driving said car on the left side of the road into a busy Auckland, dealing with the perversity of locked telephones, and wandering through the old and new city, it was time for a little lie down. We nodded off at 4 pm and would not move again. 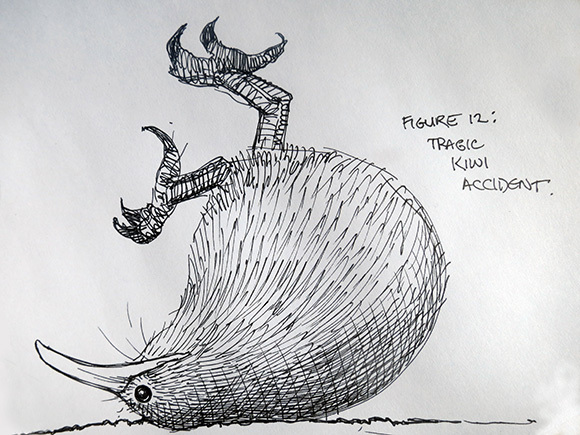 It was the Auckland Coma. We had traveled to Auckland with a terribly fit chap who carried a case large enough to fit two bicycles (though he only had the one.) 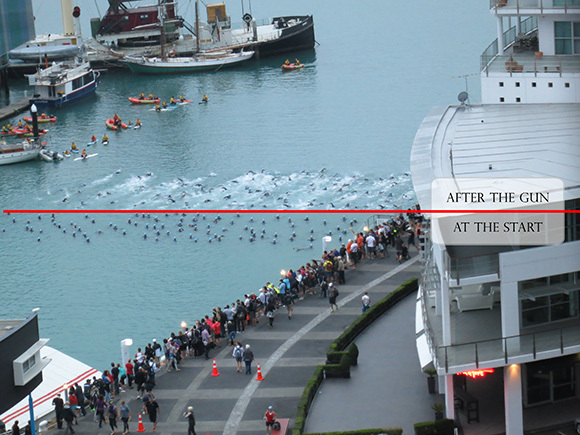 Indeed our hotel, down in Auckland’s pier district, was chockablock with frighteningly fit people of all ages. I overheard one young Aussie use the phrase “IMing” and for the first time in my quiet normal life had cause to understand that the IM in question was not Instant Messaging but rather “IronMan-ing.” This was brought home to us even more powerfully early on the morning of Day 2 at 6:15 when the booming of a loud speaker drew us out of our comas to the window just in time to witness the first wave of swimmers heading out. See? A quick survey of the streets surrounding the hotel revealed an intricate and well-laid plan for the running and/or cycling rounds of the IM. Even in our addled states, we recognized that the starting gun had been fired for us as well and it was important that we too be off like a shot. We dressed and packed with speed and managed to sneak our car onto the road ahead of the Iron Men and Women (IW?). We followed the only real road around the scenic, if somewhat treacherous peninsula (we marvelled at the number of one-lane stretches and bridges). Because of our early rousting from Auckland, we arrived in Whitianga (pronounced Fittianga) hours before our scheduled glass-bottom-boat tour of Cathedral Cove (known to any fans of the Prince Caspian movie as the gateway to Narnia – the Inklings have all their books adapted down here you know). Handily, the boat company was flexible and after a quick snapper lunch and some delicious ice cream, we headed out. Yes, seeing live snapper, billowing seaweed, and beautiful rays below the boat was nice. 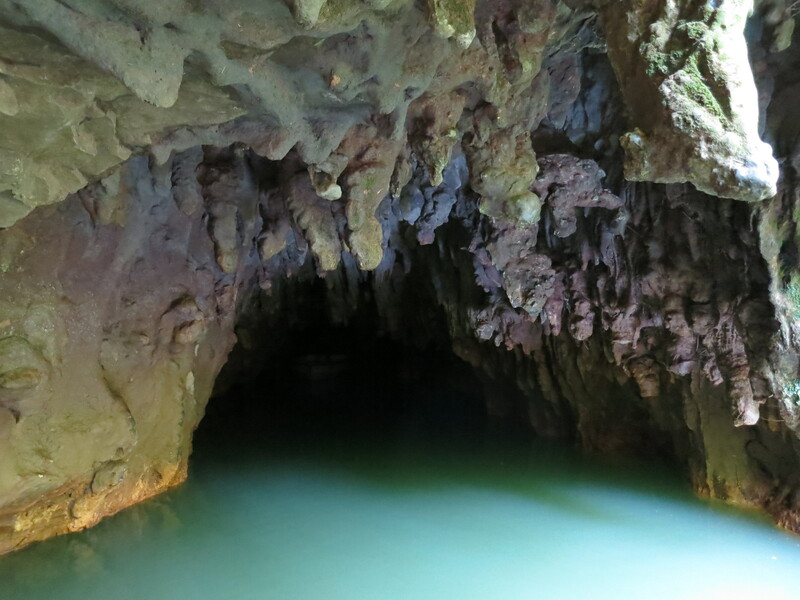 But the geology of sea caves, basalt and natural concretions was beyond anything we’ve ever seen! Because the water was a cold 12 degrees, there was a minimum of snorkeling, and a maximum of coastal gawking. I thought especially of Jim Mueller as we surveyed the small island that sits at the edge of the continental drop-off…. 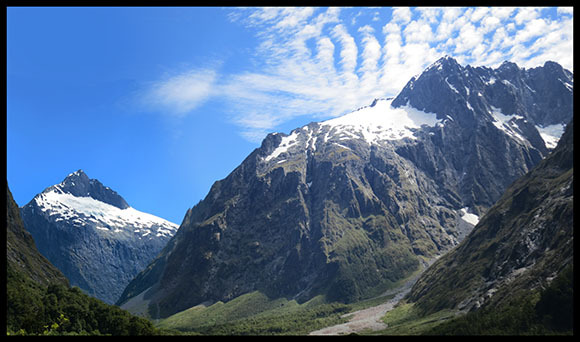 Day 1 – Not In Kansas, But Assuredly Not In New Zealand Either. 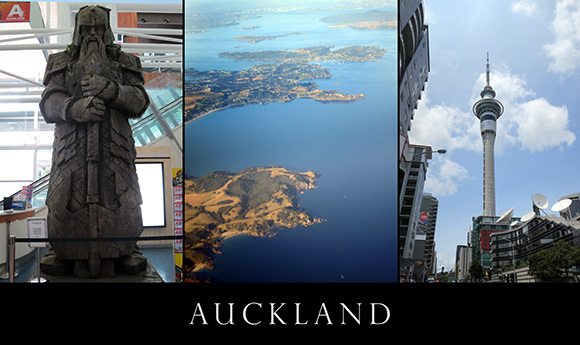 The road to New Zealand inevitably passes through the City of Angels. Usually on a stopover of hours but sometimes, as in our case, a couple days. The morning series of ad agency drive-bys went swimmingly. And our lunch with the splendid Clare Grant (better known to some of you as Miss Sir Terry Pratchett, to others as a member of Team Unicorn) took place at one of her old LA haunts. Stories of our glamorous backgrounds were exchanged, and travel tips offered all around. We headed off to a meeting with Samuels Advertising, for whom I had many years earlier painted 6 Laurel & Hardy DVD covers (the old neighborhood off Hollywood Boulevard always has me hearing the live version of the classic Kinks song in my head). 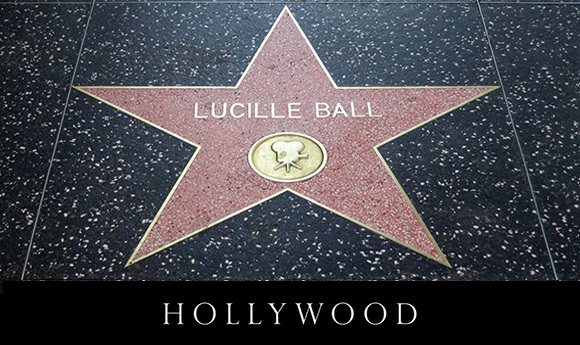 While there are still amputees using Brasso on the stars’ names, and people selling badly-copied and continually-outdated maps to the homes of the rich and famous, in other ways this neighborhood has come up in the world. My recent painting of Amanda Palmer as Neil Gaiman’s Media was called to mind by this certain star…. 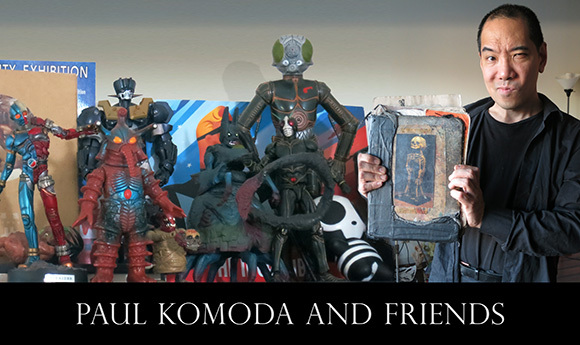 After a marvellous meeting with David Samuels, we headed to Universal Studio City and the new home of Paul Komoda. Paul’s huge Predator figure is as yet unfinished, but it promises (amid numberless wonders and horrors) to be his finest piece yet. Also, one of his largest. We absconded with him in pursuit of gelato, but other wonders (including blazing orange stuffed sheep) were also on the menu. Here’s a glimpse or two of Paul and his ménage. From the House of Komoda, we ventured on, traveling toward the setting sun through the Valley of the Shadow of Mulholland. Finally stopping only at Jason and Kemi’s. Conversation, delightful food at Pho21, and successful campaigns against my hosts at Scrabble and Anagrams followed. To avoid the morning commute madness on the 101, we nipped up Ventura and crossed into Hollywood through Laurel Canyon to meet with the proprietress of Neil Gaiman’s Neverwear. We got to meet the oft-absent Drew, dine on sumptuous brunch, and talk about the omens for our trip. They were good. With a brain filled with ideas for the work ahead once the trip is through, we set off once more for distant agencies – this time in Santa Monica, where we haunted the promenade and overlooked the creation of some radical new signage. Chow with Bino at his favorite Indian cafe where the Saag Paneer (among other faves) was the best we’ve ever had. The massage that followed was the perfect end to a whirlwind visit. Then off to LAX. Just in time for the Air New Zealand computers to go down…. We were there for less than 15 minutes before it came back, but the suspense was palpable. Finally onto the plane at 10, and out of the country not so long thereafter.